During Fanfest 2015 in March, CCP Ytterbium, Senior Game Designer and member of the CCP Games development team, “Game of Drones”, presented a vision of new and improved structures in EVE Online (see the presentation here). This was immediately followed up by a dev blog that summarized the key points of CCP Ytterbium’s presentation. An additional dev blog that provided more details on office and market hubs, now to be called “Citadels”, was recently posted. CCP Games’ vision for new player-owned structures is extensive. It dramatically enhances the capabilities of structures well beyond their current roles in the game. Player-owned starbases (POSes) will be phased out completely, in favor of a far more scalable and functional array of options, ranging in size from small (mobile deployables, about 100 meters across) to extra large (giant stations, up to 100 kilometers across). Players will be able to set these up for their personal use, or allow access to their corporations or alliances, or even allow open public use, at their option. Set-up and management of these new structures is expected to be easier than today, and configuration will be far more flexible, with a variety of slots available for customizing modules, rigs, and specialized service components. A conceptual illustration of a possible new player-managed structure. Players’ initial reaction to this dramatic revamp of structures has been generally positive. As seen in the feedback posts on the EVE Online forums, most players enthusiastically welcome the broader vision, albeit with some trepidation at the potential extent of changes to gameplay that they will entail, especially in wormhole space. For the most part, players are keen to begin seeing the new structures introduced into the game as soon as possible. They are eager to get their hands on the promised new capabilities that this enhanced vision provides, if it all comes to fruition as initially described. Although most players anticipate the short-term advantages of the proposed structure system, few have yet to fully consider the long-term implications of CCP Games’ stated direction. While the new structures will certainly provide more freedom of choice and open up new options for different types of gameplay, they also enable CCP Games to realize a long-aspired goal: passing control of everything in EVE Online to the players themselves—including control over the fundamental nature of different types of space in which player-managed structures are placed. In short, the new structure system could lead to a reduction of NPC Empire-controlled space in New Eden—or at least very significant changes to how it is defined. Much of what CCP Ytterbium presented should not be a surprise to veteran players of EVE Online. A large portion of what he presented has been previously stated by other CCP Games developers. In fact, the journey to improved structures, the enablement of more direct control by players and the resulting implications for Empire space started years ago. 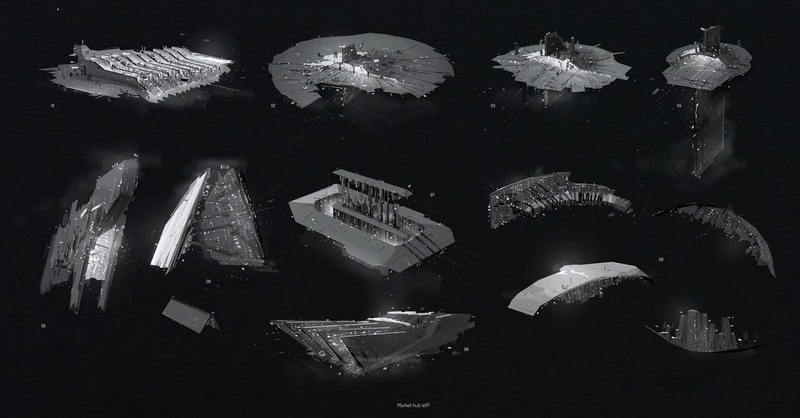 At Fanfest 2012, then senior game designer CCP Soundwave spoke openly about prospective changes to player-owned starbases, saying that he wanted to see the elimination of POS shields, a starbase fitting system similar to ships, and the ability to anchor POS towers anywhere – all elements now included in the current vision for structures. The CSM summit meeting minutes from May 2012 contain even more detailed notes about the intended direction for player-owned starbases, which support CCP Soundwave’s intended course. The trailer video, entitled EVE Universe: Origins, which was unveiled at Fanfest 2013, includes a character who many players now call “angry CONCORD guy”. He is dourly viewing a map of a growing threat to Empire space. The narrator says, “The Empires are losing their grasp on power.” CCP would never have woven the Empires’ decline so graphically into the lore of the game, if they did not intend to eventually pay it off. Angry CONCORD guy doesn’t like what he sees happening to the four Empires. During the keynote address at Fanfest 2014, Lead Designer CCP Scarpia said, “I want you to be able to build and operate any structure in the game, at a location of your choosing, without having to negotiate artificial barriers. 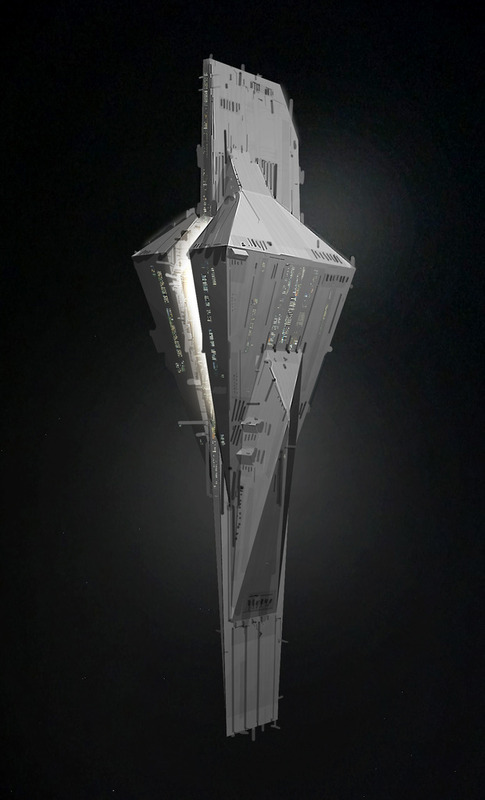 And conversely, I want every structure and asset in the game to be destructible.” When we look at the features and functions that CCP Ytterbium outlines in his Fanfest 2015 address and dev blogs, we see that most services provided by NPC-operated stations could be replicated in the proposed structures – as well as some new possible capabilities. 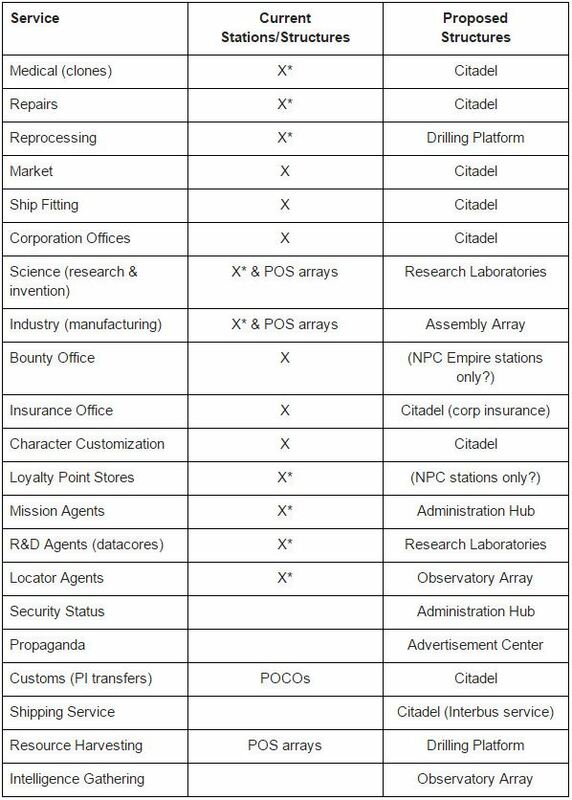 Based on this, the need for NPC stations in is greatly diminished. Player-owned structures can provide almost all of the services required. *=not in all stations Finally, there is the emerging threat from the Drifters, which may actually be CCP’s deus ex machina for introducing the player-controlled changes they envision. While all of the facts are not yet known about Drifters, we do know that their Jovian-based technology is very powerful. Their battleship-mounted weapons are similar to Titan doomsday strength in destructive capability. The recent lore reports indicate that the Drifters are collecting capsuleer bodies to inhabit, and that they are amassing in strength for an imminent invasion. But what will be the target of this possible attack? The biggest threat to the Drifters comes not from the relatively small number of capsuleers, but from the immense forces of the four Empires, and to some degree, from CONCORD. After all, it is the Empires—not capsuleers—who invaded Sleeper facilities to steal implants, in order to create the immortal soldiers we now see in DUST 514 (read the chronicle here). Some EVE lore experts believe that the Drifters are former Sleepers who have emerged from their virtual reality construct, perhaps to defend themselves against the Empire threat. Given that CONCORD’s rapid response ability is based on Jovian technology, and therefore probably vulnerable to the Drifters, is it any wonder that they seem to be so nervous lately? Indeed, CONCORD has been working actively to suppress information about the Drifter threat, to avoid widespread panic among the Empire populace. When you add up all the evidence, the path to diminished Empire seems more than just conjecture—it appears likely. The long-stated intention of CCP to provide more player control, combined with the means to do so with the new structures, and the emergence of a previously unseen and powerful threat, all foreshadow huge changes to the status quo in Empire space, and to the map of New Eden. According to recent reports by The Scope, the Drifters are massing for a possible invasion. Let’s indulge in some tinfoil-hat speculation as to how these changes may unfold. I proffer the following possible scenario to illustrate how the reduction of Empire space may come about. Imagine a time when the Empires’ power is under attack. The Drifters are unleashing a series of powerful assaults on stations in lowsec Empire space. None of the four Empires are spared from these new incursions. In each attack, the Drifters appear suddenly in large numbers from artificially constructed wormholes, destroying NPC corporation stations quickly and efficiently. The Empires call on capsuleers for help, but in most cases, the Drifters succeed in their unpredictable raids. Capsuleers rush to fill the resulting gaps in local services by constructing their own citadels. Most of these replacement structures are ignored by the Drifters – their primary enemy is the four Empires, not independent pod pilots. Anyway, the new structures present a tougher nut to crack, as they possess improved configurability and adaptability, enabling much better defenses than those possessed by NPC stations. The Drifters turn their attention to selected highsec stations. They interfere with CONCORD’s Jovian-based rapid-response capability, effectively neutralizing them. CONCORD’s ability to assert itself as useful part of any defense force evaporates. The Empires can gather impressive defenses in numbers, but can’t respond fast enough to sudden, concentrated attacks by overpowering Drifter forces. With reduced CONCORD coverage, the security status of some highsec systems converts to lowsec status. The pirate factions take advantage of this by expanding their spheres of influence. The four Empires simultaneously pull back their borders and retrench themselves in smaller, more defensible enclaves, separating themselves with buffer zones of new lowsec systems. The Factional Warfare battlezone expands to encompass more systems, and the traditional Caldari-Amarr and Gallente-Minmatar alliances break down, resulting in a four-way conflict. Eventually, the Drifter attacks begin to decline, as their numbers are limited. They cannot sustain a prolonged conflict, due to attrition in every engagement. They can’t collect enough qualified corpses (capsuleer or Sleeper) to construct new bodies to replace their losses. The Drifters retreat back into their own wormholes, and through them to Jovian Empire space, even though those regions have been ravaged by the explosion of Caroline’s Star. CONCORD offers a deal to provide increased security to capsuleers who are replacing NPC corporation stations with their own structures. In exchange for facilities in player-owned structures (i.e., Administration Hubs), CONCORD offers improved security in those systems, and policing over inter-capsuleer affairs, thus raising the sec status back to high in those systems where there is significant CONCORD presence. The capsuleers become CONCORD’s new patrons, beyond the Empires. As a result, in systems outside of Empire space, the control of security status passes to the collective will of the capsuleers in each system. Even in traditional nullsec space, some structure owners take CONCORD up on their offer, turning a few isolated systems into CONCORD-patrolled freeports. Structure-owning capsuleers also begin to invite agents from NPC corporations (and pirate factions) to their locations by providing them with offices. Agents begin to dispense missions to pilots from these new facilities, across all of the New Eden cluster. Jita shrinks in importance as a central trade hub, as it is now more dangerous and difficult to get there. Under licenses granted by each Empire, capsuleers begin constructing new stargates to bypass lowsec and reconnect regions of highsec space again. Other pilots start building bigger stargates to reach into new areas of space as yet unexplored, including Jovian regions. The map of New Eden changes dramatically, with smaller regions of NPC-controlled Empire space, a wider faction warfare zone between them, and large areas where the security status is determined solely by the capsuleers occupying those systems. The storm spreads across New Eden. When Will the Storm Arrive? We have some time before we see these kinds of dramatic changes. If CCP’s intention is to transfer control of security status to capsuleers’ use of structure facilities, then we will probably have to wait until the majority of the new structures system is released. Then the Drifter storm can be unleashed, and prophesy foretold in lore can be fulfilled. Certainly, the scenario that I am suggesting is based on conjecture and guesswork, and how events may actually unfold may be quite different. But I offer one additional piece of evidence to consider. After CCP Ytterbium’s presentation at Fanfest, I asked three CCP devs if the extensive vision for structures meant that players could eventually take over the role of NPC stations in the game. Each of them agreed that more player control of all aspects of EVE Online was the intended direction, even for stations, though none would confirm if, when or how it would happen. Still, I perceived a silent nod—eventually, and perhaps sooner than we think, the new structures will enable more change than most players are expecting. We live in interesting times in New Eden, perhaps far more interesting than we think.